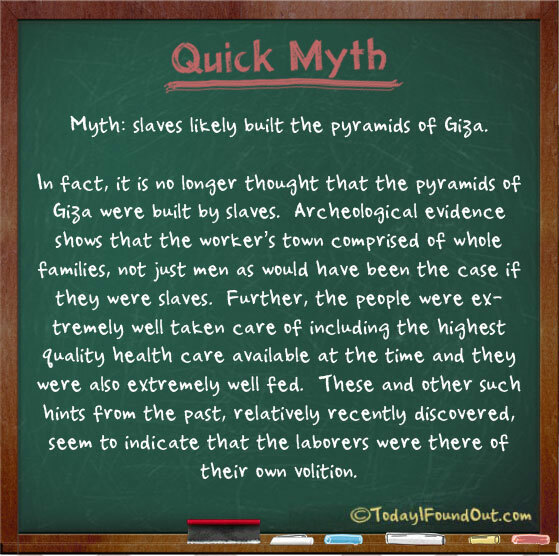 Myth: slaves likely built the pyramids of Giza. In fact, it is no longer thought that the pyramids of Giza were built by slaves. Archeological evidence shows that the worker’s town comprised of whole families, not just men as would have been the case if they were slaves. Further, the people were extremely well taken care of including the highest quality health care available at the time and they were also extremely well fed. These and other such hints from the past, relatively recently discovered, seem to indicate that the laborers were there of their own volition.